KATHMANDU, Jan 20: The price of fruits and vegetables in the Nepali market is generally at a higher end throughout the year. While the consumers in the capital and other cities often complain about the high price of fruits and vegetable, the case of farmers producing vegetables is different as they make only nominal money despite the hard work they put into their products. 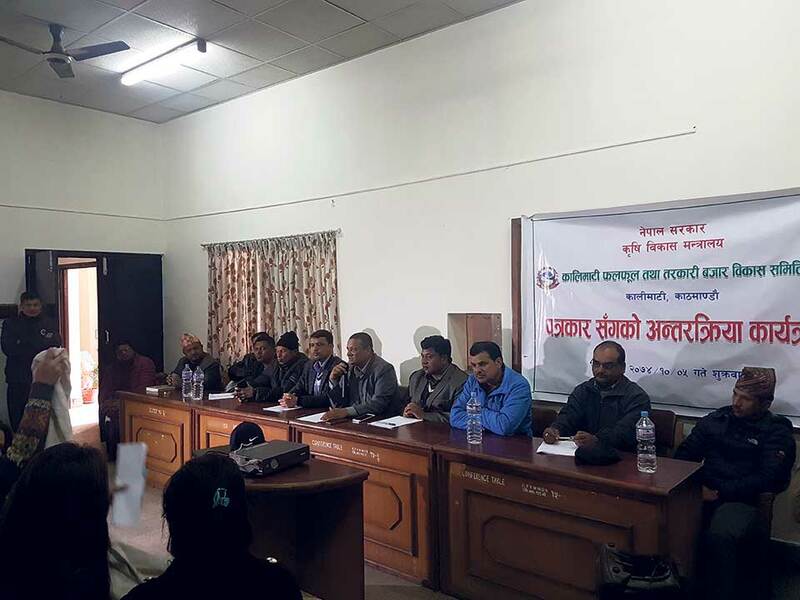 At a press conference organized by Kalimati Fruits and Vegetables Market Development Board (KFVMDB), deputy director of the market Binaya Shrestha said that there has always been a big difference in price of agricultural products from when it leaves the farms and to when it reaches the retail market. The reason behind such a price difference is mainly the transportation procedure, according to Shrestha. “The Nepali fruit and vegetable market has an abundance of products produced within and outside Nepal. The step by step transportation of these edibles contributes to the extravagant price in the market,” said Shrestha. Shrestha added: “Farmers sell their products to the traders at a collection center within a district, the transportation of these products is based on their production site. Before hitting the market, different levels of handlers each take a certain amount of profit, inflating the price gradually,” who further explained. Due to lack of proper infrastructure in the country, the transportation process is very costly, according to a report published by KFVMDB. Due to lack of proper market places all around the country, a chunk of fruits and vegetable come to Kathmandu. Unlike other ready-made edibles, fruits and vegetables are perishable and can go bad with the passage of time. Due to the lengthy transportation time without proper preservation (refrigeration) mechanism, the vegetables at times start rotting before hitting the market. The costs of rotten vegetables that are wasted are recovered by inflating the price of fruits and vegetables, which shoots up the price even more. “If there were to be more marketplaces, the produced goods would be scattered across many districts minimizing waste and loss,” added Dahal. Despite professionalization of agriculture in the country, the agricultural yield produced by individual farmers is far less than that in other nations. “Nepali farmers have not been able to produce vegetables at a mass scale due to lack of technological advancement and unavailability of resources during key seasons. This has been hindering Nepali farmers to produce vegetables and fruits to their full potential,” explained deputy director Shrestha.